The Fiat Yamaha Team began a two-day test in Jerez, southern Spain today and Valentino Rossi made a positive start to the second winter session, finishing the day second fastest behind Dani Pedrosa. With this being the final test for the team until February, these two days are especially important in order to gather as much information as possible for the Japanese engineers to work with over the next two months, as they continue to develop the 2009-spec M1. Clear skies and a cold wind meant track temperatures were very cool in the morning and Rossi chose to wait until 1.30pm, when the newly-resurfaced track had warmed up slightly, to begin. As per the new single-tyre rule there are just two front and two rear specifications available for the test, with the riders supplied with two tyres of each specification, making eight in total. The world champion completed 20 laps on the 2008-spec bike and 20 on the new 2009 prototype M1, on which he set his fastest lap of the day in a time of 1・0.135, His team-mate Jorge Lorenzo was 3rd with a best lap of 1・1.163. Jorge Lorenzo, 2008痴 leading MotoGP rookie, began the final test of the year today at Jerez de la Frontera in Spain, alongside his Fiat Yamaha team-mate Valentino Rossi and 12 other MotoGP riders. Cool temperatures meant track time was reduced to just a few hours in the middle part of the day, but Lorenzo made the most of the time to finish third fastest. As at the post-race test in Valencia one month ago Lorenzo has two bikes available to him here; the 2008 M1 and a test version of the bike, with some new prototype parts, but with the new single-tyre rule having now come into force he spent today on the 2008 bike, working on adapting his set-up to the new tyres. 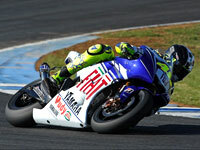 He completed 51 laps with a fastest time of 1・1.163, putting him third fastest behind Dani Pedrosa and his team-mate Rossi.